Thanks to those readers that sent me an email after my last column on a Baby Bounder. You never know if your columns are read until you get feedback. With all of the doom and gloom reported in the mainline media, it is good to reflect upon some successes and positive directions. I have been updating and improving the Go Green RVing material and I plan to lead a "Go Green RVing" seminar at the May Lake George BOA Rally. I look forward to seeing you there. One of the trends I have noticed in our online RV business is the increase in people who are willing to do some basic maintenance and accessory installation themselves. Perhaps this is based upon the economics of saving a few dollars. Many realize that they will be keeping their coach longer and they will not be trading it at the next major service interval. Others are taking advantage of the slow car market to upgrade their tow vehicle. Many Toad makers have a requirement to remove a fuse before towing. Our RVing FuseSwitchTM has become an "in demand" item. If you have not experienced the convenience this little accessory provides and you have a tow vehicle that requires a fuse to be removed to tow it, then check out TechTip #39 on our website and call us. 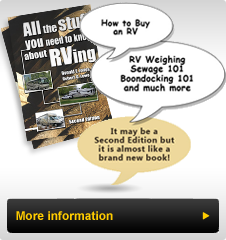 Tow vehicle braking systems have moved into the "must have" category of many RVers. Great steps have been taken over the last 15 years from the original "box style" systems to today's state of the art, toad braking systems. Most are easy to install and use, many no longer require a box to be put in and removed each time you tow and many more provide in the Coach control and indication of the Toad braking. Some activate the Toad's power brake and simply require that you "flip the switch to tow". Often the type of coach braking system provides the direction in choosing one type of Toad Braking system over another. My favorite for diesel coach owners is the SMI Air Force One which is designed to work with diesel coaches having an air brake system. This unit safely takes a small amount of air from the coach air brake system, creates vacuum to allow the Toad's power brakes to operate and uses a small amount of air to gently activate the Toad's brake. A tiny 6" by 3/4" air cylinder is attached to the brake pedal arm. It pulls the pedal down to the floor when operating the Toad's brake. A small air canister is located under the hood of the Toad to allow the system to operate if a breakaway event occurs. A simple unified air and electrical connection is made between the Coach and the Toad. The beauty of this system is its simplicity. Few moving parts, activation of the tow brake only when the coach brake is applied and true proportional braking. Depressing the coach brake pedal a little gives the Toad a little braking, pressing harder, puts the Toad brake on harder. Other systems that use the brake lights on the coach as a brake signal will apply the Toad's brake when the exhaust brake is activated which can compromise braking safety on a long downhill run with the exhaust brake on. Do-it-yourself RVers can install the system using the detailed instructions which includes photos of most steps in the process. A similar system - the Stay-In-Play Duo - is designed for all other coaches. The Duo includes a very efficient vacuum pump mounted in a compact under-the-hood box with an inside the car mounted G-Force controller to determine when to activate the Toad brakes. Check out our Braking and Accessory Pages for more information.